One of ReSharper’s most notable features, Code Analysis, is now unleashed and ready to hunt for bad and dead code—without even opening Visual Studio. Dubbed as InspectCode, it is as simple as a command-line tool can be and requires a minimum of one parameter—your solution file. But as it runs it will apply all of ReSharper’s code inspections—that’s over 1,400 of them—to code in all languages supported by ReSharper! Can’t wait to try it out? Find the latest ReSharper 8 EAP build, download and unzip the Command Line Tools package, and then run InspectCode [SolutionFile]. While the tool works its way through your code, let’s take a closer look at its features and use cases. The list of found issue types where each type has a description, severity level, and a link to the corresponding Code Inspection Wiki entry where available. Also, each issue has a category that can be used to group similar issues. The list of found issues where each issue has its type and place in a file. The issues are grouped by projects. How the output should be processed is up to you. But here are a couple of recommended next steps: transform the output to an HTML report, or generate some messages on your continuous integration (CI) server based on number and types of detected issues. Now let’s see how we can use the tool and what exactly we can do with its output. It may be helpful to run it on your local machine, but only if you don’t have ReSharper, because with ReSharper you can get inspection results for a selected scope with a couple of clicks and, if necessary, export detected issues to a report file. A more promising case is to use InspectCode on a CI server where you can integrate it in the build script and add code inspection results to your build reports and messages. To learn more, refer to the TeamCity documentation or download the latest version to try it out. By the way, if you come up with more usage scenarios as you try out InspectCode, please share them with us. If you have previously worked on the target solution with ReSharper, you may have already configured code inspections settings. If so, InspectCode will find your custom settings in .DotSettings files and apply them. If there are no settings files, then the default severity levels will be used for all inspections. If you want to configure InspectCode on a CI server, you can make all configurations locally with ReSharper, save the settings to the Solution Team-Shared layer, and then commit the resulting SolutonName.sln.DotSettings file in your VCS. InspectCode on the server will find and apply these settings. /output (/o) – lets you set the output file. By default, the output file is saved in the %TEMP% directory. /project – allows analyzing particular project(s) instead of the whole solution. After this parameter, you can type a project name or a wildcard that matches several projects within your solution. /no-buildin-settings – can be used to ignore settings from the Solution Team-Shared layer (SolutonName.sln.DotSettings file). /caches-home – lets you specify a custom location for the data that InspectCode caches. By default, the %TEMP% directory is used, unless there are settings files, in which case the one specified there is used. This parameter can be helpful if you want to use a fast SSD disk for the cache or if you want to store all your build processing data in a single place. How are command line tools licensed? The EAP version is a free 30-day trial. We are still working on the licensing policy and it will be announced soon. Can I configure InspectCode without ReSharper? Currently, configuration without the use of ReSharper is restricted to some basic settings like enabling solution-wide analysis, selecting projects to be analyzed, choosing the output file, and specifying cache location. Does InspectCode consider the Visual Studio project setting ‘Treat warnings as errors’? Yes. It will change the severity of issues corresponding to compiler warnings. Will InspectCode analyze a solution that fails to build? Yes. In this case you will see all compiler errors in the output in addition to ReSharper-specific issues. The only requirement for correct analysis is that all dependent libraries be referenced correctly. If you have more questions or feedback about the Command Line Tools, we’ll be happy to hear from you. This entry was posted in How-To's and tagged code analysis and quick-fixes, command line, ReSharper, ReSharper 8. Bookmark the permalink. so here how i have used the tools. They do nothing for me what is wrong? The problem is in the ‘#’ symbol in the path. Thanks for listening! This is what we need to really make effective use of ReSharper. Can’t wait to try it out. This is pretty awesome. Really hope the licensing policy works nicely both for open source solutions where everything needs to live in source control since build servers likely are shared, and enterprise environments where having to install things on a build server is possible. @DmitryMatveev. Yes, thank you, it was a problem. I know that to an extent TeamCity competes with Bamboo, but I’d love to see this integrated with Bamboo. If the support was there, out-of-the-box, it would likely go some ways to having ReSharper deployed more widely where I work. Thanks for letting us know! Here’s a bug report based on your feedback. @Vinod, do you have write access to that shared folder? Sorry for answering you so late and thanks for your question anyway. We didn’t announce dupFinder yet so its help is incomplete. Actually everything should work if you specify absolute paths or paths relative to the dupfinder.exe, not to the solution file. This is because dupfinder, unlike InspectCode, doesn’t base its analysis on the solution file. We’ll announce this tool and come up with all details in the nearest future. Is there any news about licensing policy for this tool? @Sarrasim Not yet, please hold on a little more. Can you please update command line tools build for EAP? The last one is expired. @Alexander, will do, thanks for noticing. Is there an InspectCode mode that would be suitable for use in a source control plugin. In other words, I would like to configure my source control system to evaluate all prospective source code submissions against my Resharper rules and reject submissions that do not conform. This would require something more granular than evaluation at the project or solution levels. Your scenario looks very interesting, but currently inspectCode can only take Visual Studio solutions as input. At this point, we’ll make the command-line tools for free. We’ll be looking at ways to provide additional tooling for them, and if we come up with ideas, there might be a paid edition. However, it’s too early to talk about that right now. In the scope if 8.0, they’re going to be free. We’re working on a license agreement reflecting this. – Allow me to run the inspectcode/dupfinder on a .csproj without having to specify the solution file or the project name. Just the file. – Allow me to specify a list of .csproj files so that I can work without having a solution context. – Give me an output shaping option that outputs MsBuild compatible warnings/errors, that makes it much easier to integrate into workflows that already know how to handle those. – Can I somehow specify the Configuration/Platform to analyze? – Are you guys planning to allow me to specify a logger/formatter type,assembly that I can pass to the commandline so that warnings and errors can be streamed to the host. Running the tool, then parsing the xml is so 1992 ;). @Jesse, thanks for the feedback. I logged everything in our issue tracker. Note to others: if you have feature suggestions, please feel free to sign up and use the issue tracker – they won’t get lost there. We have a fairly detailed project structure with a lot of shared .targets files. Each of these is imported by referring to $(SolutionDir). However, it seems that the tool(s) subsitute ProjectDir which means that almost none of solution is actually inspected. Is this a “feature” ? How can I use the dupfinder from within Resharper 8.0? Duplicate Finder is not a part of ReSharper as an extension to Visual Studio, it’s only available as part of ReSharper Command Line Tools. I try this example with my solution and projects, but when there are more than one project i cant run this command. How can i do like this ? Thanks Dmitry , it work. but there is another problem. When i run thşs command with two project, there are two project under issues tag. One of them is correctly produce output but the other don’t produce output correctly. Output is below. File=”..DocumentsVisual Studio 2012ProjectsDeneme2PeakScreen1App.cs” –>(..) Here when i try to find this path i catch the FileNotFoundException normally. What can i do to achieve this problem ? @yasin, If the tool misbihaves with the correct parameters, please log a bug in our issue tracker, choose ReSharper Automation Tools (Command Line) as a subsystem. @yasin, Sorry, I didn’t get you. You mean, two projects in different solutions or get it from R# user interface? How can the tool produce xml file immediately? 1) How can I get the same behaviour as resharper if i have incorporated the StyleCop rules? Which setting file should I reference? 2) I use some legacy files, which very high number of code issues. How can I exclude certain files? 1. If the StyleCop rules are set with ReSharper options, then you should get the same results as if you inspect code with ReSharper, provided that you do not move your solution from the local machine. If you want to run the analysis on a server, then the local settings will not apply. To apply all the necessary settings on the server, you need to save all of them in a single settings fiile and then use this file through the /profile (/p) parameter. 2. You can use the settings to exlude specific files, here is how to exclude files from code analyis. If you run InspectCode on a server, save the configuration of excluded files to the same settings file, together with your StyleCop rules. Sorry for being away for so long. InspectCode options and the generated XML configs only allow to exclude projects. To exclude files, you need to do it with ReSharper. Unfortunately, ReSharper settings files are not designed to be edited manually, so my only suggestion is to install a trial version of ReSharper to make the necessary configurations. But it generally produce well format. File attribute has a problem so it produce relative path. Is it a bug? How can i achieve this problem? Check out the Command Line Tools package in the latest R# 8.1 EAP. The file attribute now shows the path relative to the solution. Can i take absolute path from file attribute ? No, the ‘File’ attribute in the report can only show paths relative to the solution. Could you tell me why you need absolute paths? How are you going to use or process the report? 5:04:52.897 INFO – WARN Internal error: The condition (!mySaving) is false. 15:04:52.898 INFO – WARN Internal exception thrown: The condition (!mySaving) is false. Thanks for the feedback, Peter. I logged the exception in ouir issue tracker. Problem was not with the inspectcode, but the idiot user. Should have unblocked the download before unzipping. Erased the installation, unblocked the zip, unzipped and all was good. Sorry ’bout that, you should delete my previous posts before someone gets the wrong impression. I removed your previous comments. Anyway, thanks for the interest in our tools. When i run inspectcode.exe from cmd i take output as below. ERROR: Referenced project with guid ’66c17914-ebeb-413d-af22-a0eef30fd70a’ not found in solution, it’s output assembly wasn’t found either. ERROR: Referenced project with guid ‘c77fa773-eec7-409a-9941-f9b777a7098a’ not found in solution, it’s output assembly wasn’t found either. ERROR: Referenced project with guid ’38a67e95-4716-4de8-afb3-e373a1229fd3′ not found in solution, it’s output assembly wasn’t found either. ERROR: Referenced project with guid ‘630e5f1d-382b-4362-869b-addd4429a77d’ not found in solution, it’s output assembly wasn’t found either. Although there are above errors output file is produced. I can’t take output. In my opinion some projects in solution dont have right references so it dont produce output. But in cmd it can produce output. How can i take output from c# code even though projects in solution have some reference problems. In my case, build errors are not important. Please try the latest 8.2 version of the InspectCode. If this would not help, could you send us a project where you have errors. You can use our issue tracker to report your problem and make necessary attachments. Can I use custom plugin with Command Line Tools ? when i inspect the entire solution using VS2013+R#8.2, it reports 85 issues. When i run code Inspection @ Teamcity (latest stable) it reports 226 issues, no matter whether i point it to the solution *.sln.DotSettings or not (as documented, it should find it automatically, i only need to specify it if i don’t want to use the default *.sln.DotSettings). To make sure there’s no local settings messing things up, i’ve reset all settings layer exception the solution team shared one. now, when i open the *.sln.DotSettings i can see that there are very little settings. Apparently only modification to default values are stored. 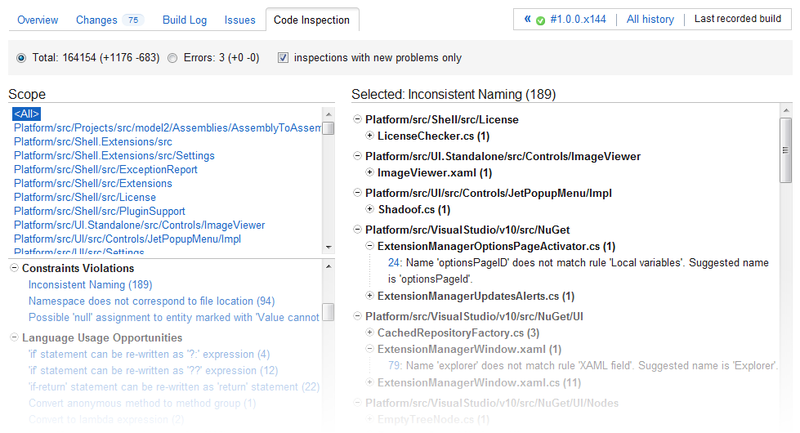 Could it be that TeamCity CodeInspection uses different default settings then my ReSharper installation? How can i keep them in sync? What happens if i manually set some setting in *.sln.DotSettings to the default value and edit it later using ReSharper UI? Will i loose the settings? If you have a solution, I would like to have it. I have the same issue. Is there a way to tell InspectCode to report only 1 issueType? I need to report only redundant using directive issues. There is no direct way to disable specific issue types from InspectCode. 4. Set the severtiy of all code inspections to ‘Do not show’. I know that there are hundreds of ispections there, but you can change severity for the whole groups, so this is not a big deal. 5. Then type ‘redundant using’ in the search box on this page, and set the desired severtity (e.g. ‘warning’) for this single inspection. 7. Now, when you run InspectCode locally, the results will only include redundant usings. 8. When you return to ReSharper, go to ‘ReSharper | Manage Options’ and clear the check-box for the settings layer that you created to go back to the normal set of inspections. I’ve tried this but the inspection time is the same. I have a large solution with hundred of projects so the inspectcode takes a long time to check everythings. I use some legacy files, which very high number of code issues. How can I exclude certain files? To exclude certain files, you need to do it with ReSharper – inspectCode will pick up the R# setting files. Unfortunately, ReSharper settings files are not designed to be edited manually, so if you don’t have R#, you can install a trial version to make the necessary configurations. I am trying to run a resharper inspection on gitlab for first time. what are the files I need on the CI server? inspectcode and other files in the command line tool folder? do I have to install resharper on server? Also where the shared solution dotsettings file has to be on server? You need all files from the command line package. You don’t need ReSharper on the server. The shared .sln.DotSettings file is saved in the solution folder. InspectCode will find it there without any additional configurations. Please see the log below.I am trying to run on gitlab.I am lost here with this message. Running in 64-bit mode, .NET runtime 4.0.30319.42000 under Microsoft Windows NT 6.2.9200.0 Component JetBrains.Application.SinceClr4.Extensions.JetPackageRepositoryFactoryEnvironmentComponent [Singleton, Corrupted] construction has failed. Could not bind a part catalog assembly “JetBrains.Platform.Shell.SinceClr4, Version=106.0.0.0, Culture=neutral, PublicKeyToken=1010a0d8d6380325” by loading from file C:\bin\JetBrains.Platform.Shell.SinceClr4.dll. Could not load file or assembly ‘file:///C:\bin\JetBrains.Platform.Shell.SinceClr4.dll’ or one of its dependencies. Operation is not supported. (Exception from HRESULT: 0x80131515) An attempt was made to load an assembly from a network location which would have caused the assembly to be sandboxed in previous versions of the .NET Framework. This release of the .NET Framework does not enable CAS policy by default, so this load may be dangerous. If this load is not intended to sandbox the assembly, please enable the loadFromRemoteSources switch. See http://go.microsoft.com/fwlink/?LinkId=155569 for more information. Do you have full command-line tool packages unzipped on this machine? Looks like some assembly files from this package are missing. 1) Remove Zone.Identifier NTFS Alternate Data Stream (http://msdn.microsoft.com/en-us/library/dn392609.aspx) from the ZIP file before using it. 2) Use an unzip tool which won’t read the Zone.Identifier NTFS Alternate Data Stream on the ZIP container and write it to each of the files it’s extracting. 3) Download the ZIP with a tool which won’t add the Zone.Identifier NTFS Alternate Data Stream to it when saving to disk. I have run the inspection. it has taken around 38 minutes though! I am getting this below error from the cmdline. Hello and thanks for the feedback. I logged this problem to our issue tracker: https://youtrack.jetbrains.com/issue/RSRP-466280. Please feel free to watch and upvote.